For this example, I'm using Libby's new 'Paper Clips - Itty Bitty Alpha Templates', but the same steps apply for any full page alpha sheet you may want to use. Note: for these alphas, I have previously clipped my papers to the template, done any recoloring necessary, and merged them into a single alpha layer. I have found it is easiest to do this prior to cutting the alphas out. These steps are applicable to Photoshop and Photoshop Elements on a PC, but should be able to be adapted to different graphics programs (or to Mac equivalent keyboard keys). Some of the shortcuts may not work outside of Photoshop, but you should still be able to accomplish the same thing. Step 1: Drag the full sheet alpha onto the top of your layout. It's best to have this on top so you can easily see what you are doing. I'll often also try and shadow the the entire alpha layer before I start cutting out the individual letters so that each letter will inherit the shadow, although it works just fine to shadow after you're all done instead. Step 2: With the alpha layer selected in your layers palette, hit the letter 'M' to select the marquee tool. You can look at your tool button to see if you have the marquee tool that you want (rectangular or elliptical) selected. 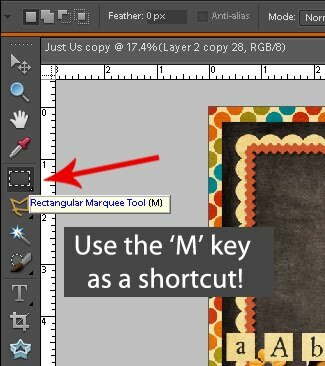 In PSE, if you keep hitting the 'M' key it will cycle through the two marquee tools. (I thought Photoshop did the same thing, but it's not working that way for me right now in CS4, so you may have to use the mouse to change it if the one showing is not the one you want). Step 3: With the marquee tool now selected, use your mouse to draw around the first letter you want to cut out. Note: If you don't want to go through the process of naming the layer, you can just hit 'Ctrl + J' and go straight to the next step, but I usually find that it's worth the extra second to name the layer for ease of use later on. 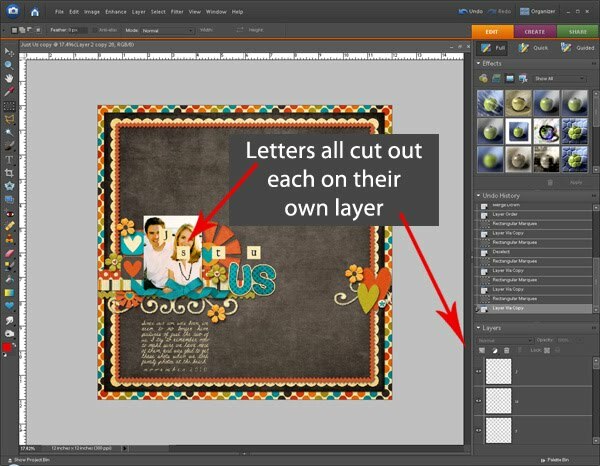 Step 5: At this point, your newly cut-out letter layer will be on top of the alpha layer and will be selected. 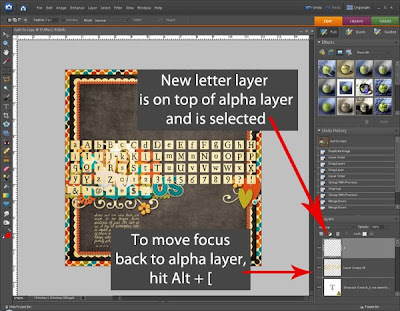 In order to be ready to repeat these steps to cut out the rest of your letters, you will need to highlight the main alpha layer before using the marquee tool again. To do this easily, hit 'Alt + [' (left bracket symbol). 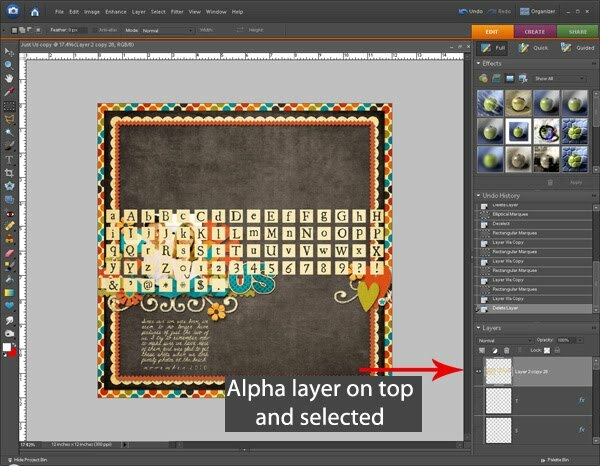 This shortcut will move your active layer down one layer in the layers palette, which in our case, puts the focus right where we want it on the main alpha layer. Step 6: Since the marquee tool should still be active, you can now go back and repeat step 3 - step 6 (select the letter, create new layer, move focus back to alpha layer) for each additional letter you need to cut out. 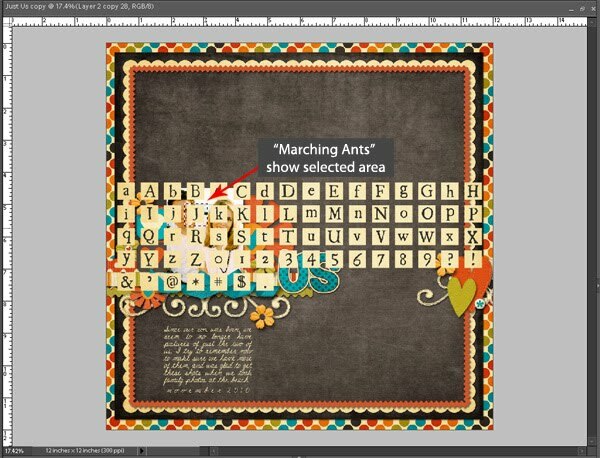 When you have finished cutting out all your letters, you can hide (or delete) the full alpha sheet and you will be left with all the letters you need, each on their own nicely-named layer. 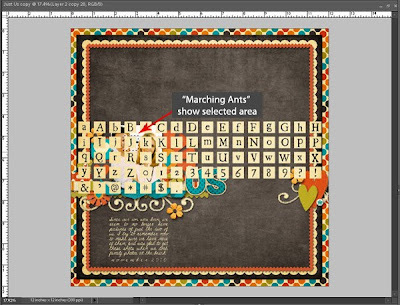 From there you can move your letters into place, resize, and do whatever you need to make your title look great. It may look like a lot of steps, but if you try it out (especially with the shortcuts), you'll find it goes pretty quickly. 6) Repeat steps 3 - 5 until all your letters are cut out. That's it - easy peasy! Try it out the next time you have a full sheet alpha. After a few times through the steps, you'll be surprised at how quickly you can make it work. Hope this gives you a few tips that help speed up your scrapping process! I have always wondered what the best way to do this was. I was cutting individually and dragging onto a new file, then dragging the whole thing to my layout. This is sooo much easier!! !